He everyone! How’s your week going? I’ve been busy as usual! Stamping, inking, die cutting, filming videos. 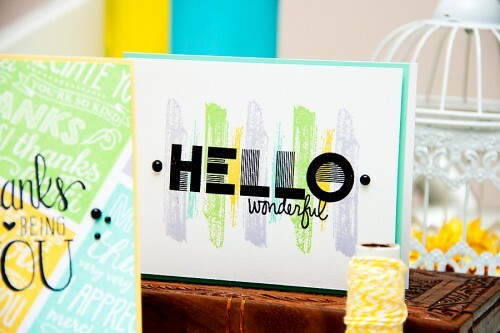 Today I wanted to share a fun color combo that I “discovered” while playing with my stamps and inks from Hero Arts. I’m sure this is nothing new, but I’ve never used this combination before and I really liked it, I think its perfect for spring! 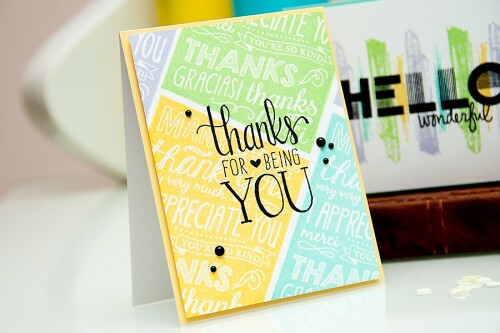 Thanks for being you – I used a fun Thanks Blackboard background stamp and stamped it several times going diagonally. I used a different color of ink each time and ended up making this fun color blocked background! 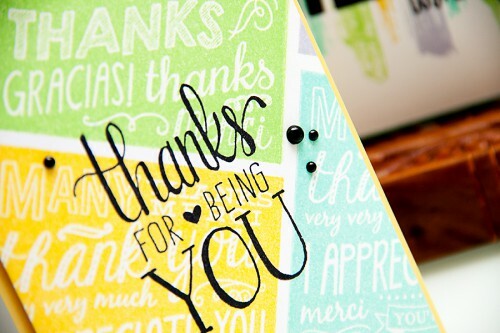 The Thanks for being you sentiment is a new rubber stamp from Hero Arts Spring 2015 Catalog that is going to be available soon. I also used little black pearls to embellish this simple yet colorful card. The stamped panel is popped up onto a yellow card base using foam adhesive. 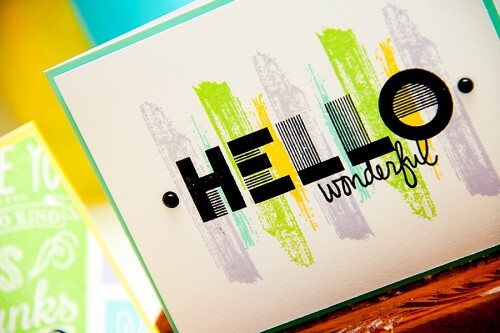 Hello Wonderful is another card using this color combo. I started by stamping brush stroke images onto white panel and added a bold sentiment in black. To add a little something extra I used two black pearls and adhered each at the end of the main sentiment. So what do you think? Do you like this color combo? I know I sure do! I wrote it down and I’ll be sure to use it again in the future. Gorgeous card and a very elegant colour combination – i would love to receive a card like this :)! It’s Veronica from Romania, we have been in touch regarding the first Romanian scrapbooking fair. I wrote you an email with the lastest news last week and i was wondering if you still interested to join us. Also, i just wanted to let you know that so far we have guests from Sweden (Milo Lilja) and Poland (Mariusz Gierszewski). Love them both Yana! And talk about clever with the background stamped multiple times!